Given all the available options in the market today, efficiency and reliability are two things you must consider when purchasing a water heater. And if you live in an area where the temperature of incoming water reaches a low 37oF, then the Ecosmart ECO 27 Electric Tankless Water Heater is the perfect one for you. At this temperature, it can heat nearly three gallons per minute (check here for exact flow rates in every State). With ECO 27 you get hot water when you need it. One of the advantages of ECO 27 is that you can install the heater close to where you will use it. This reduces the time it takes for the water to travel through the pipes and as a result, hot water is quickly delivered to the point of use. And because the unit only heats what is demanded, water heating costs are reduced by up to 60%. 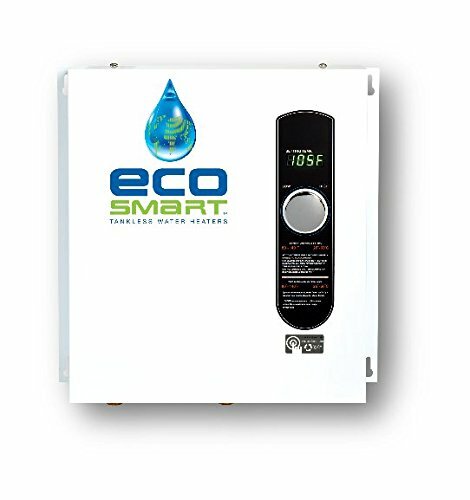 Ecosmart ECO 27 Electric Tankless Water Heater is most suitable for houses in the colder States or Canada. It is also the right choice for heating up Jacuzzi or large Roman-style tubs that have high water demand or high flow rates. With ECO 27 you are guaranteed to never run out of hot water, even if you simultaneously run multiple showers and other water-intensive machines. Ecosmart ECO 27’s smart sensor regulates the amount of energy necessary to heat the water. The unit uses three (3) 9kw standard Emerson electric heating elements with brass tops and a copper heat exchanger to prevent electrolysis. Because the unit is 99.8% energy efficient, you get to enjoy significant savings even after the first month of use. Owners have reported savings by as much as 85% in their electric bills. Any DIY enthusiast with decent plumbing and electrical skills can easily mount and hook this unit up; but a licensed electrician is preferred to ensure validity of the warranty. Ecosmart’s customer service is one of the best and most responsive. If you have problems with installation or just have a few questions about the product, they’re quick to provide you with answers and solutions. Rest assured that should your unit fail sometime in the future, you get unbeatable service with this warranty. Just make sure to get a licensed electrician to sign off the warranty; otherwise, it won’t be valid. It may take a week to get used to setting the water in the shower. But once you’ve found the right setting (you can set the temperature in 1o increments with the digital thermometer), it maintains that temperature without fluctuating. Note that hot water is initially released, cools down for a few seconds, and then becomes hot again. We suggest you give it time to heat up before you get into the shower. Also, you can only get very hot water at low flow rates. Simply use or change your existing shower heads to low flow ones. This unit requires a lot of power (200 amperage and 3 x 40 DP breakers), so be prepared to shell out around $300 for additional materials to upgrade your electric service or panel. The Ecosmart ECO 27 Electric Tankless Water Heater is the best one in the market. It may be pricey, both in terms of the unit cost and the additional upgrades (if necessary), but it’s well worth the investment. Just be sure that this model fits your hot water and electrical requirements before purchasing and installing. Beekz.com © All Rights Reserved.